If there is one thing all our guests agree on its the exceptional beauty of the local landscape.To do it justice with words is difficult but there are other factors which I can briefly point out. Tourism here is relatively light and it fits in with everything else without creating heaving tourist traps at every place of interest. There are hot spots at peak times but generally you can see places for what they are. When you arrive at a beautiful village you are free to wonder at your leisure in peace and you won't think that it's not worth getting your camera out ! This area was very active during the middle ages when it was ruled by the Counts of Toulouse. The plains between Albi and Toulouse became wealthy by producing wode, and Gaillac produced wine. This wealth made the area interesting to the English and the French. There was also the religious crusade by the Catholics against the Cathars. All that activity has left a rich history which can still be seen in the many fortified villages, Castles, Cathedral, Churches and buildings which remain from those times. The last 100 years have had far less impact on these places than we are used to seeing and it's this mix which is so attractive today. Our nearest village Castelnau de Montmiral is a perfect example of a 13th century medieval bastide village. Perched on a hilltop, build of white stone, it has fortified walls and retains an impressive gateway entrance to the village. Follow the narrow, flower filled streets and arrive at the magnificent arcaded square. 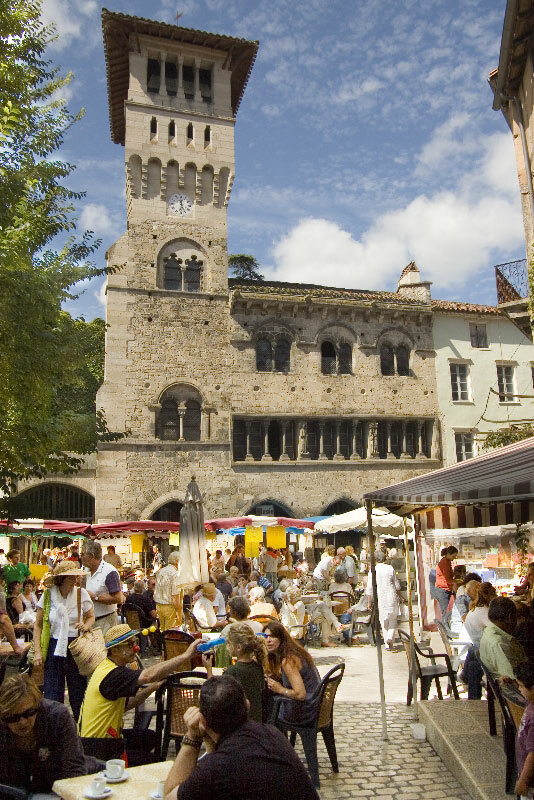 The nearby villages of Cordes, Puycelci, Bruniquel, Penne and St Antonin Noble Val provide wonderful places to visit and a little further on are Najac and Caylus. All set in beautiful and often dramatic settings, with fantastic architecture, restaurants, walks and history to enjoy. The exceptional city of Albi, a UNESCO World Heritage site is an easy 20 minutes away and has a wealth of architecture, Art Work - the most comprehensive permanent collection of the works of Toulouse Lautrec, the red brick Cathedral of St Cecile, the old restored covered markete Cloisters at St Salvi, beautiful gardens, the River Tarn and so much more. Grapes have been grown here for over 1000 years and being very labour intensive has created thousands of small farms, hamlets and villages. Some are now reminders of how things used to be and their decline has left us with the rural pathways and tracks which make great off road walking riding and cycle routes. The old traditional buildings such as the public washing places (lavoir) and Pigeonniers (pigeon houses) sit perfectly in this setting and add further character, interest and beauty. Here the stone villages nestle into the undulating terrain which is carefully managed by the small farms. A little further north it becomes a little more wild & wooded, with deep gorges cut into the limestone, the biggest being the Averyon gorge which is 200 mts deep. There is the massive Gresigne Forest which dominates the skyline and is a place of interest for all: wildlife lovers, walkers, horse riders etc. The largest oak forest in Europe - no wonder everyone sleeps so well !! To the south are the vine covered sunny slopes of the Tarn valley and as the landscape opens out and along the river the pink brick medievel towns of Albi, Gaillac, L`isle Sur Tarn and Rabestans are to be found. All the villages have summer festivals and events where the whole family are all very much welcome and if there is an admission charge it's minimal. Many places and activities in the area are described in more detail in other sections of this website. Specific dates of events are listed in our LOCAL EVENTS section.